Although not intentional, the nine month lapse in time strikes me as symbolic – a period of gestation. I’m eager to see what changes I notice in the individual gogos, and in their group. I am also bearing 26 letters from their “sisters” in Vernon to hand-deliver, and 100 photo calendars from our group as Christmas gifts. This time I will have a more in-depth conversation with a few of them to try to increase our understanding of their situations. Ivone Matsane, carrying her recently orphaned granddaughter, Precious, is in mourning for her son. It’s a scorcher day as I follow Ruth Magagula, our very competent manager of Sitabogogo (‘Help a Grandmother’), through a maze of board shacks and tree-branch fences. The dirt path twists like an intestinal tract, garbage heaped up along the sides. Barefoot children with adorable faces wide-eye me with a combination of suspicion and hope. After 20 minutes of searching for one particular letter-writing gogo, we come upon Ivone Matsane. She walks bare foot in the dirt, a young child wrapped in traditional style on her back. As Ruth asks her for direction, she explains to me in English that this little granddaughter has only last week become an orphan. Her 23 year old father, Ivone’s son, was stabbed to death in a fight. Ruth points out the black mourning skirt that Ivone will wear for six months. Although she is not an active member of Sitabogogo, Ruth tells me our funds from Vernon are helping with a monthly supplemental food parcel. The media plays up violent crime in South Africa which, admittedly, exists. I wish that, on a per capita basis, they would pay as much attention to the millions of loving and caring gogos who exponentially outnumber criminals. If crime is rampant, so too is love. As we trace our convoluted way back (without finding our intended gogo), I stop short in front of an exquisitely beautiful arum lily, a soft yellow one, blooming amidst the squalor. I insist on taking a photo of it – such a metaphor for what I’ve experienced. Six year old Mahltse shyly unrolls her kindergarten certificate and offers it to me. She’s a very pretty child and she breaks into a wide smile as I exclaim over her accomplishment. Mahlatse is an orphan, and she is HIV+. 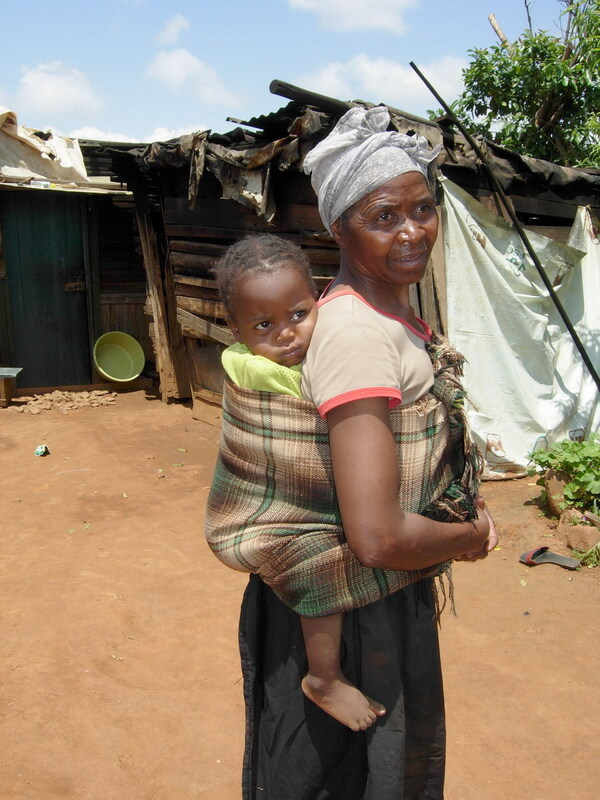 Now she is being raised by her gogo, Ellen Mgwenya, and is one of three orphaned grandchildren Ellen is caring for. Ellen is a member of Sitabogogo. At the age of 73 she still carries her tall, thin frame majestically, as do many African women who have spent a lifetime carrying heavy loads balanced on their heads. She is thrilled to receive a letter and photos from her Canadian partner, Anita Bennett. Ellen tells me that she and her husband had seven children, but in the past few years they have lost three daughters, at the age of 31, 37 and 28, to HIV/AIDS. Ellen cared for them in her small home until they were so sick that they went to the hospital to die. More recently a fourth adult child was critically ill and near death but, as of 2007, the Sabie hospital finally has anti-retroviral drugs. Her son has responded well and is now back at work. I inwardly grimace, recalling the years when I lived in Sabie from 2001 to 2005. Those were the years when South African president Mbeki publicly denied that HIV caused AIDS, and his health minister, Ms Tshabalala-Msimang, claimed proper nutrition, rather than ARVs, was the solution for AIDS. She delayed making the drug available, although it had technically been “government approved”. Sitting in this little room with me now are the victims of this high-handed and short-sighted policy which resulted in hundreds of hundreds of thousands of deaths. And then there are the multitudes of children affected – some orphaned, some infected through mother to child transmission, or both, as in Mahlatse’s case. 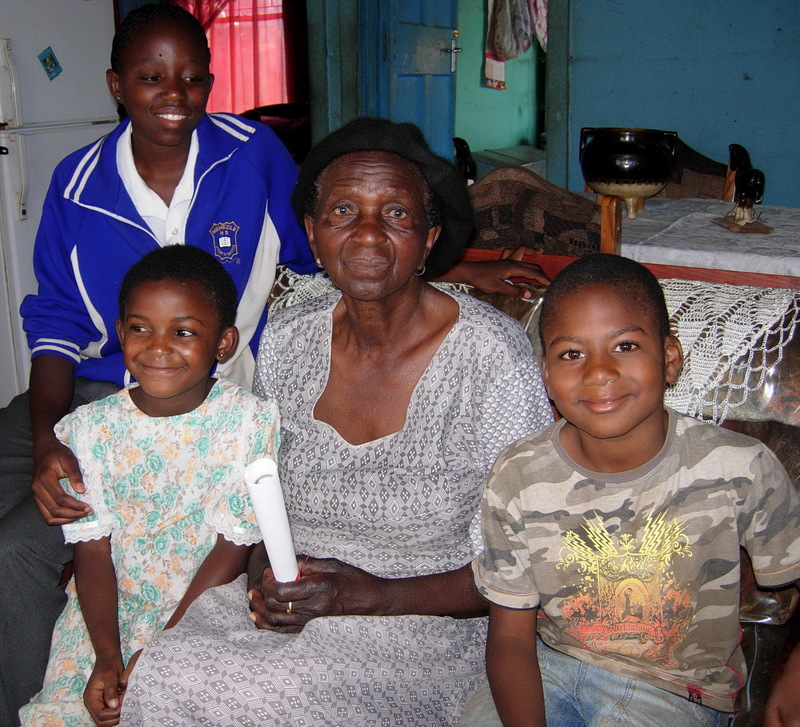 Gogo Ellen Mgwenya (73) raises her orphaned grandchildren Bonisile (16), Mahlatse (6), and Lesego (7), after losing three daughters to HIV/AIDS. Ellen points to a tray loaded with 100 ml. bottles of medicine. Mahlatse must drink two bottles per day of medicine, plus another bottle of multi-vitamin concoction. “She frets, “says Ellen, “always she is having upset and pain.” Once a month she goes to the hospital for a blood transfusion. As we visit, Mahlatse plays with her cousin, a boy of 7, also orphaned. A teenaged granddaughter, the third orphan Ellen is raising, has just written her last final exam of grade 9 and is feeling buoyant. She asks me questions about my children and grandchildren in Canada, how did I get here? (“airplane”). Then whose car is that? (“a rented car”). She’s never heard of that, so I explain how it works and she is amused by the concept. Ellen tells me that in her younger days she worked for 35 years as a nursing assistant in the Sabie hospital, and her husband worked in the boiler room there. She is old enough that her schooling occurred during pre-apartheid times and, therefore, was a positive experience. She recalls her participation in basketball and running, and taking part in singing performances. Now, in her senior years, she is once again involved in the parenting and school activities of her orphaned grandchildren. I hug them good-bye. Mahlatse’s name translates as ‘Lucky’ . . . I pray she is.